Do you really want to know the reason you can’t get over your affair? Part 1: 5 ways your affair started in your thoughts. These are some examples of questions that I get from many different women. Their inability to get over their affair. Or, they wonder WHY they even had the affair in the first place…the very thing they thought they’d never do. My answer might sound simplistic. I’m sure you might wonder if there’s more to it- and there is. But my answer is a very important first step in your affair recovery plan. you’re still thinking about your affair partner more often than you care to admit…this is the post for you. My friend, your affair began in your thoughts, and it’s your thoughts that are still keeping you stuck there. 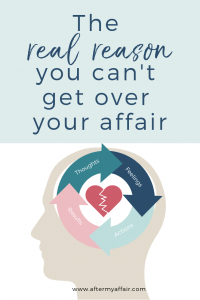 Your thoughts are the real reason you can’t get over your affair. But before you think it’s that simple, keep reading. Understanding how the think, feel, act cycle is affecting your affair recovery is your key to change. She added Circumstance to the beginning of the cycle, and Results to the end, like a sandwich. Circumstances- Thoughts- Feelings- Actions- Results. But I like to call it the Bicycle Concept because it’s a great analogy. As far as I know, I’m the first one to put this bicycle analogy to the concept; yea, I’m just crazy like that. But I hope it helps you to picture the concept more…if not, ignore it. (just your feelings following where your thoughts told them to go), you need to decide to stop (the brakes=another action). 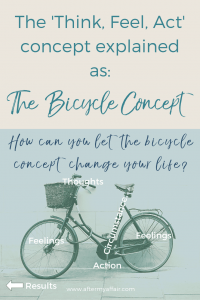 Okay, let’s break down each one of these parts in this ‘bicycle concept’, because it’ll be so powerful for you, if you use it! The circumstance we encounter is the beginning piece of our think-feel-act cycle. Because before you have a THOUGHT about anything, there’s a circumstance. Circumstances are just neutral events or situations. Think of “Circumstance” as just facts that are happening in life, or of a situation, free of any judgment or opinion at the moment. These are things that are out of your immediate control and neutral facts. They don’t have a label of good or bad (although we often give them labels quickly), but they’re just neutral. or how a friend reacted to something we told them. But circumstances are also everything that’s happened in our past. That can mean what happened to you last week, in your childhood, or even, for example, the history of how our country was founded. Circumstances are just unchangeable facts in this moment. You cannot change the weather. You can’t change your boss or what he/she says about you, how your husband feels in the moment, or how a friend is treating you. We also can’t change the past, or what happened in our childhood, or the history of our country. All past is unchangeable. They’re all things outside of our immediate control. Some of them you won’t ever be able to change. Here’s the important commonality in most circumstances; they’re neutral, until you think a thought about them. in the world. God as the creator of this universe gets to say what those right’s and wrong’s are. and our reactions start in our thoughts. Have you ever noticed how 2 people can react differently the same situation? One person may say their cancer was such a life-changing event that helped them see what’s important, so they could change their life. Another cancer sufferer may think that person is crazy, and believe that nothing good come from cancer. You see? The circumstance is not creating your feeling, until you think a thought about it. As a former cancer patient twice, I’m somewhere in the middle of those 2 thoughts- yea, I’m weird. Thoughts are just a sentence in your brain that you’re thinking about a circumstance. nion; your assessment of whether something is good or bad, right or wrong. We often think of our thoughts as facts, and unchangeable. But it’s important to remember- your thoughts are optional. (ex. “I’m so fat”, or “I’m not outgoing enough to have many friends”). They might not feel optional right now, but they are. (Remember my bicycle analogy in Part 1 of this series? if there’s some who would disagree, then it’s an optional thought. S0, What are your thoughts? Are you continuously thinking about your affair partner? Are you telling yourself you can’t live without him? Do you keep having thoughts about how much you miss him? That is one main reason you can’t get over your affair. Your thoughts are keeping you stuck, like in quick sand. And just like quick sand, those thoughts can eventually take you down into a affair relapse, if you don’t change them soon. Yes, you can change your thoughts, because they’re optional! you realize you can change where your thoughts are leading you. Circumstances can’t be changed, at least not in the moment, they’re outside your control. But your thoughts ARE in your power to change. This doesn’t mean it’s easy, it takes practice to think about what you’re thinking about. Most of us just let our brains control the directions we sail. But it takes practice. Like a toddler learning to walk, we wouldn’t expect her to stand up and start walking without falling down right away. It takes practice and a lot of falling, and getting back up, to try again. It’s a lot like that with directing what we allow our brains to think. Our feelings, or emotions, are directly affected by the thoughts we initially had about a circumstance we experienced. (especially the ones that are not pleasant, and even uncomfortable sometimes), then we can stop hiding from ‘negative’ emotions and face them head on. Because if we can dissect our feelings to having started from a thought we had, then we can see that just because we felt something, doesn’t make it a fact. Think of your emotions as a warning system. We all have thousands of thoughts everyday, we can’t be aware of every single thought. But when you experience an emotion, it’s a sign to pay attention to what’s happening in your mind. We usually only want to go back to our original thoughts when we feel a negative emotion or one of discomfort. But we can do this when we have good feelings (or moods) also. Also, if we’re not aware of looking at our emotions as possible warning signs of a relapse, we’ll fall right back to old behaviors. So, being led by our feelings is another reason you can’t get over your affair. For example, when you find yourself thinking ANYTHING about the affair partner, stop, and recognize it. If you don’t, your feelings for him will just be stirred up all over again, until you’re faced with the strong urge to call, text or visit him. And that’s the last thing you want to do. I’m in the process of trying to lose weight. So on my weigh in days, I get on the scale. (a situation that is reading back to me a factual thing that I cannot change at that moment). But the thought that I allow myself to think, right after seeing that number on the scale, is what will drive my emotions afterwards. What do you think my emotions will then be? I’ll be feeling pretty crappy right? I’ll start feeling like a failure, and might even start feeling worse about myself for failing, (which often perpetuates the cycle if I used food to feel better). As long as I keep thinking that way, what will my motivation be to continue my healthy eating habits to lose weight? I probably won’t keep motivated for very long. So that leads to the next part in the bicycle concept cycle, action. This is what you DO in response to how you feel, (feet on pedals to get the result). We either take action, or inaction, but our actions don’t just happen out of nowhere. They’re always influenced by how we feel. we can begin to ask more important questions BEFORE we act upon our feelings. “what do I do when I feel angry or jealous? How do I act when I don’t feel loved and appreciated? Do I get lost in my thoughts, until I’m feeling so miserable and angry that I don’t know why? At the very end of the Think, feel, act cycle that Brooke Castillo teaches in her Life Coach school, is Result. Results are what happens from the action you took (your final destination). The interesting part is, you are creating the results just for you. Your results only ever applies to you. Your results can affect other people’s circumstances, as our affairs did for our husbands. But you don’t create results for others and they can’t create results for you. The whole framework of Circumstance, Think, Feel, Act, Result cycle is about you. Each one of us has our own cycles going on. They have their own thoughts, feelings and actions they’re working through, and you have yours. The thing to remember is that the results you have now, is showing the original thought you held at some point. It’s a domino effect. “The brain is always looking for evidence to support what it believes, so the best way to see this is to think of the results of 2 different types of people. The thing is, both of those types of people can have the same circumstance, but see it completely different. It’s how they thought about it. The CIRCUMSTANCES in your life are just facts, completely neutral, and out of your immediate control. They’re simply neutral situations that hold no other meaning than being unchangeable facts. Remember, Circumstances can also be people or past events. We then think of THOUGHTS in response to the circumstance we’re encountering, giving it some type of label or meaning to it. These thoughts are just sentences going through our heads, and how we define our circumstance. We also can learn to have control over our thoughts by recognizing, and replacing, the thoughts that won’t serve us with good feelings and behaviors. As we process our thoughts, they then create FEELINGS; these are any one word emotions we feel in our bodies, such as lonely, sad, happy, depressed. These Feelings then cause us to take ACTION. by our thoughts and feelings first. Finally, our actions create the RESULTS in our lives. We can see the results of many things in our lives and trace back to what our original thoughts were first. Being aware of this cycle in your life is truly the first part of the equation to changing a behavior, habit or feeling. Your brain will likely resist the change, and it takes practice to recognize and change our thoughts, but it’s vital in your affair recovery. Back to my example about weighing myself. but I don’t want to give up on my weight loss goal. My thoughts would need to change. What would my feelings be after that thought? I’d likely feel more energized and determined to not give up. Which will eventually produce the weight loss. You’ll notice part of this is self compassion and not thinking negatively about myself. I’m not going to lie, this was my situation this very morning. telling me to give up working so hard at eating healthy and exercising. So I chose the last example, gave myself self love and compassion and recommitted myself to not giving up…..
And then I put my scale away for awhile. But that’s okay too. If you know there’s a temptation to regress back to old thinking or old habits, then do what you need to do eliminate that temptation. That’s where my No Contact Checklist comes in, if you’re trying to stop an affair-ending any contact with a affair partner. The checklist works as a tool alongside this framework. In my next post (part 3) on this subject I’m going to share HOW to take your knowledge of this framework and put it into action. Because knowledge without action is just knowledge with no place to go. It’s like the bicycle being all ready to go but never leaving the garage. If it feels weird and foreign to you, that’s okay. It’s not your fault you didn’t know this before. If you can’t stop a certain habit, ask yourself “what is the message I am thinking, and keep telling myself, about that circumstance?” (that person, place or thing). I’ll break it down to show specific examples regarding acting out in an affair and trace it back to what your original thought was. How this applies to the Christian. This think-feel-act cycle is not contrary to God or the power of God in our lives. I know there are other Christians who might think I’m saying WE have all power over everything, taking God out of the equation. I’m definitely not subscribed to that. For me, God is the most important piece in this ‘bicycle framework’ because HE created our minds and He’s instructed us in the bible on how to use them. He also tells us to pray, asking for His strength in every circumstance which gets your thought’s in alignment to His power and will. What is affair fog- 5 signs to watch for.